Old school skateboard decks have been making a comeback in recent years. They have been used by bowl riders since they were considered new school, but a new form of street skating has taken them out of the pool and put them back in the streets. This style of street skating is getting bigger by the day and blowing up on Instagram and other social media platforms. It consists of a lot of no-complies, boneless and quick-footed action. Many older skaters do not understand this new craze, but a lot of our younger readers love it. So, that’s why we are putting together a list of the best old school decks around. Of course, these can be used in the pool as well, but due to the popularity of this new style of street skating, we are pretty sure most of the decks below will be used in the streets. Before we get to the list of old school decks, let’s find out what exactly we are talking about when we say “old school deck” shall we? 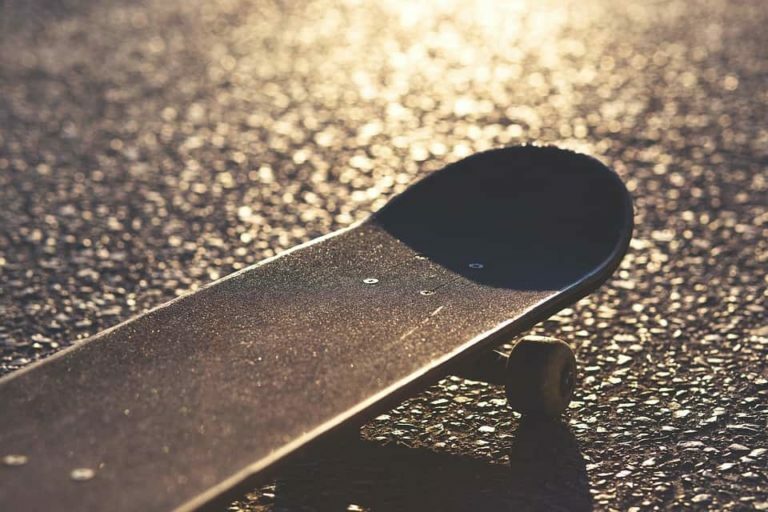 What is an old-school skateboard deck? An old school skate deck is a lot wider than a typical street or park board. The reason for this is that they were invented before Ollie-ing or getting air. This means that the weight of the board wasn’t as important, the wider the board, the better stability you have which is very important in a bowl or on a halfpipe. Also, an old-school board typically has a flat tail and then a curving or pointed nose. Once again, this is because ollies and flip tricks weren’t around back when these boards were invented. This makes old school decks perfect for carving and turning in pools and on halfpipes, but the weight and bulkiness of the nose and tail can mean that flip tricks are harder to do. Can you skate an old school board like a new school board? Well, yes and no. You can certainly skate these boards in the street, many people around the world are proving that every day on Instagram. However, because of the shape and size of an old school board, they are far harder to flip. 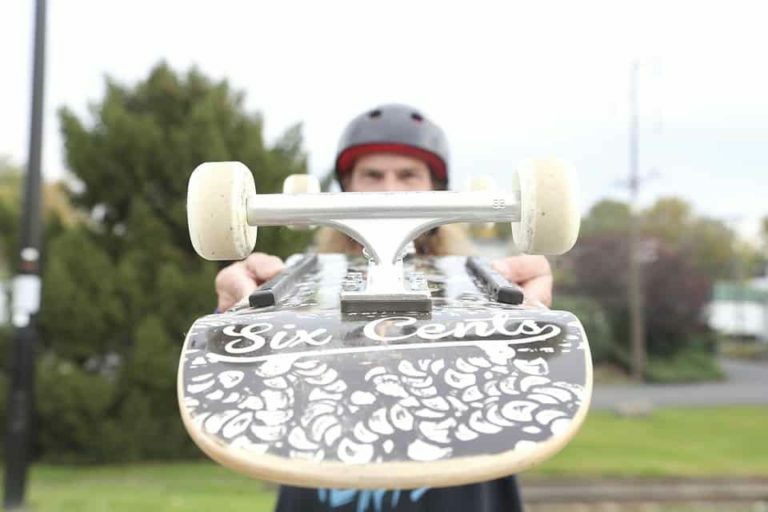 Most old-school boards are anywhere between 8.5 and 10 inches wide; this means they weigh a lot. Combine that with the shape of the nose and tail and you are left with something that is very awkward to use for flips and ollies. Having said that, old-school boards can be flipped, and many people make it look effortless. However, these people are clearly experienced, and so if you are just starting out and learning to flip, you may find it almost impossible to learn basic flip tricks on an old school board. Our advice for you is to get a “normal” shaped board first, practice all your tricks on that and then move to an old school board when you are happy and confident with your tricks. We have split this list into categories. The first is the best decks for pool and bowl skating. The second is the best old school decks for street skating. Hopefully, this can help you decide which of the old school decks below is perfect for your style of skating. This Vision Original reissue is a work of art. It would look just as good on your wall as it would in a pool. Of course, we are not in the business of telling people about art, so we will keep this review strictly about skating the board. This Vision is 10 inches wide, 30 inches long and has a 16.25 wheelbase. So, for bowl, pool or vert, it is excellent. It may even be good for the streets, but its natural home will always be a backyard pool. One of our favorite things about this board is that the hole pattern is drilled for modern trucks. This means that you can put your new trucks on the board without any issues. This just makes it a little more skateable as if it had the old truck hole pattern, you would have to search high and low for trucks that would fit the board. You may ruin the iconic graphic, so we recommend that you ride rails on this board to keep the graphic as fresh as possible. This Hosoi Hammerhead deck is, once again, an icon of design. It is one of the most visually stunning boards ever created, but this reissue should only be hung on the wall after it has been shredded to hell and back! Coming in at 10.5 inches wide and 31 inches long with a 16-inch wheelbase, this thing not only looks exceptional, it skates phenomenally well too. Just like the Vision above, this too has a modern truck hole pattern, so modern trucks will fit perfectly on this board. However, it gets even better with the Hosoi board. This board also has modern concave so if you’ve come from a modern board, this isn’t going to feel that different for you. If you want a bowl, pool or vert board that looks iconic but skates very similar to a modern board, this is it! This Jason Jesse Dodo reissue comes in at 9.62 inches wide and 31.8 inches long. It has a very nice shape to it with a nice rounded nose and a fishtail tail. 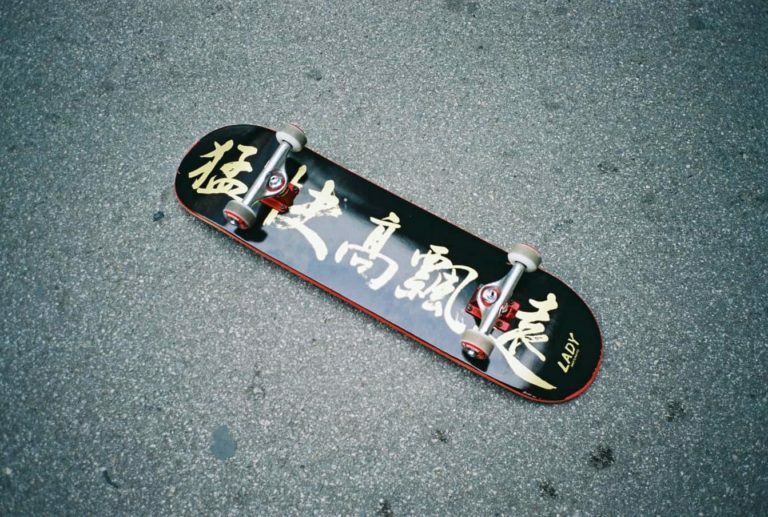 It also has perhaps one of the most iconic graphics in the history of skateboarding. Of course, it is poking fun at the Tony Hawk hawk skull graphic, but this one looks even cooler, in our opinion. This board rides very nicely and would be perfect for riding in a pool, bowl or on a vert ramp. Also, this would make a great cruising board too. So, whether you want to shred hard or cruise your way to the shops, this Jason Jesse board can do it all in a serious amount of style. Perfect wall art, hang it next to a Hawk board for maximum effect! Some may find this deck too wide, but if you’re looking for a board from this era, you know the sizes and you know what to expect so you’ll be fine! Grab it and shred it! For all the modern street skaters reading this, Ray Barbee was one of the best street skaters in the world when street skating burst onto the scene. In fact, he still has one of the best styles on a board. So, we’re sure you are now wondering why this board is in the bowl riding section of this article. Well, this board was once great for skating street, but sadly times have moved on and we can’t say it is good for street skating because the shape is just not right for the streets anymore. We know this is a shame, we would love to tell you all to grab this board and go and skate some street, but sadly we have to limit this board to the bowls and pools. However, the shape of this board really makes it a lovely bowl board. It is 9.75 inches wide and 31.87 inches long, making it a very stable and fun bowl board. Overall excellent deck for anyone wanting a piece of history to hang on their wall or a great pool board. It’s a shame that this board no longer works in the street, but this is hardly a con of this board, just a con of the world changing! The reason this is our favorite old school board for bowl is the shape and the graphic. The shape of this board feels amazing when you are riding it. It feels like a shape that has had a lot of thought put into it. The tail is a slimline fishtail perfect for carving and popping, while the nose comes to a curved point. So, although you may not be able to do too many nollie tricks on this board, you can certainly grab a few nose grabs without getting your hand bitten off. The graphic on this board is also awesome. Of course, if you love doing boardslides, this graphic will wear away if you don’t ride rails, but we would recommend you ride rails anyway. If you’re skating pools, rails are going to help you get longer slides and keep this amazing graphic looking great for ages. Overall, this deck feels and looks great and is perfect for anyone looking for their next bowl riding board. There are no cons, this board could be skated by pool, bowl, vert or street skaters and would look great in any skateboard collection! This Moose deck is 10 inches wide and 33 inches long. 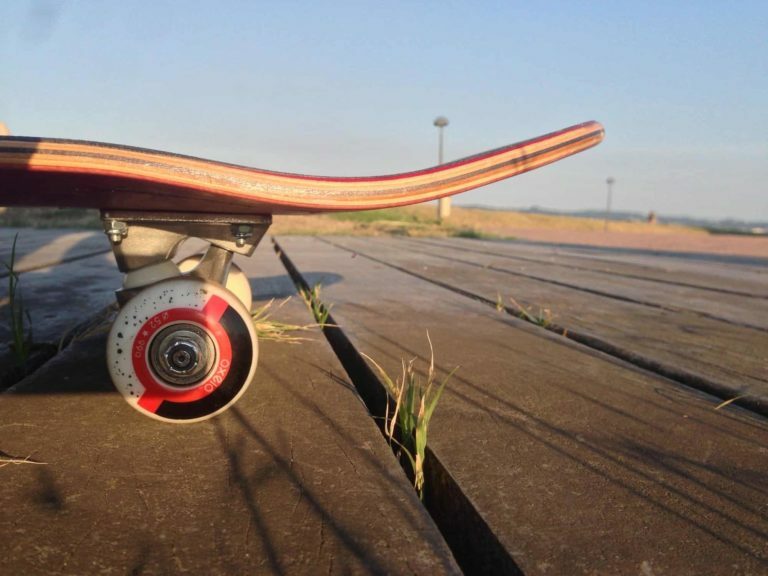 It comes in natural, or you can get yourself a deck that has a colored ply on the bottom. Although 10 inches is a massive deck for taking on to the streets, you boneless and no-comply lovers are going to love it. This deck provides a firm footing for all these kinds of tricks and will make you the talk of the park too. Whether you want to skate bowl, street or a combination of the two, this deck is going to help you achieve your wildest skate dreams. It has a lovely shape with a massive nose and tail to help you flip this monster and lovely concave for pop and control. Go grab this board if you want to boneless your way to a gold in the next Olympics! This 9-inch deck is designed for cruising, but that never stopped a skater before! If you want to take this deck into the street and give it a damn good thrashing, this deck is going to be plenty happy with that decision! This board has a nice shape to it, it isn’t too wide or too narrow, and the nose and tail are just right for control. However, the tail is fairly bulky so you may find it difficult to do Tre flips and things like that. Of course, this deck is great for cruising, it is designed for that after all. But it makes a great board for anyone looking to start skating or for anyone wanting a bowl set up. And if you want an old school board for the street, this one will be ready to shred just as hard as you. This 10-inch wide square nosed deck is the perfect pool shape, so why isn’t it in our street skating section? Well, we believe this would make a great deck for anyone wanting an old-school vibe in the streets. To get back to basics and jump off of a launch ramps, skate some curbs and generally have some fun, this is the perfect board. The nose and tail are absolutely massive on this deck. This may make it difficult to flip any kind of flip trick, but we think this is the best thing about this deck, it is challenging and fun! Imaging boardsliding a handrail on this thing! You’d be king or queen for the rest of the year! If you fancy a laugh with your friends and want a challenging, buy this board and go and hit the streets! It’s massive, so it’s seriously heavy! This Black Label Jason Adams deck came very close to being our top pick in this section. The reason for this is twofold. Firstly, the graphic is by Jason Adams who is an incredible artist and has outdone himself once again with this graphic. Secondly, this is one of the nicest boards to ride on this list. Whether you skate curbs like Jason Adams or pools like Jay Adams, you need this board! The shape makes it incredibly controllable and really fun. If you are serious red curb skater then don’t bother looking at any of the other boards on this list, just buy this one, love it, shred it then hang it on your wall! If you don’t like beers, curbs, bowls, and barneys, you won’t like this board! This Blue Tile deck has to be one of the best on this list for bowl or street. Firstly, it is 9 inches wide, 32 inches long and has a 15-inch wheelbase. This is great for a lot of control either in the streets or in the bowl; this size offers you a lot of control without being massively heavy. The shape is also excellent. This board has a slightly better tail than most on this list. The tail curves a little better and is more like a “normal” street board. This means that you should be able to flip it without too much difficulty. Overall, this is a great board, it is nice and fun and isn’t too different from a “normal” board once you get used to it. This is the board for you if you already skate street decks and want to try an old school shape. It is a great stepping stone from a “normal” deck to a proper old school board.